The 3i-201510PAR Chauvet Freedom Par case will accommodate many models and is the perfect solution for a rental house, band or DJ that travels with up lighting. The interior of this case is designed with rigid dividers to keep the fixtures from rubbing against each other with high quality dense PE foam positioned at the bottom of the case to keep the Par lights at an easy reach height. There are (10) pockets positioned around the outside of the outside of the lights to store power cables and other accessories. 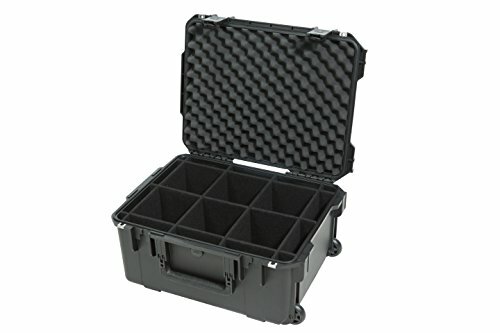 The 3i-201510PAR iSeries case is watertight, dust proof and lightweight and features a convenient push button pull handle and in-line wheels for easy transport with trigger release latches that can be retrofitted with TSA trigger latches or locked with SKB’s TSA Combination Padlock in the stainless steel locking loops.